Garage construction is troublesome, but partly pleasant. At the very least, everyone who is passionate about construction works can enjoy the process itself. The construction of the garage begins, of course, with a drawing. And the foundation to it, as well as any other construction, is the foundation. 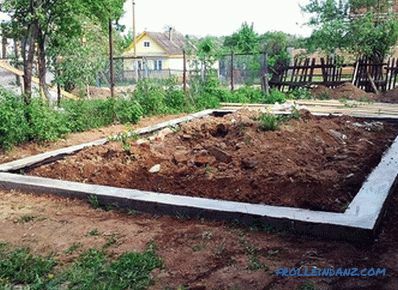 Improperly laid foundation can destroy all the work, so you need to know all the details of its arrangement. 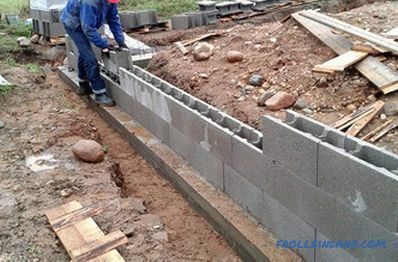 In the article we will talk about how to fill the foundation under the garage with your own hands, consider the various options: tape, floating, rubble. 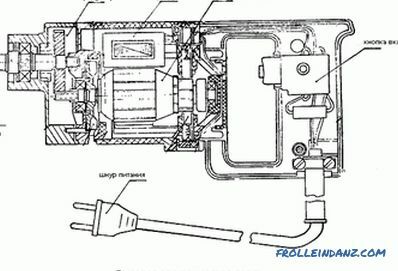 First Stage of work - a drawing of the future structure. 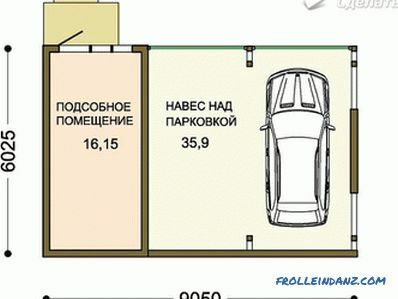 It is necessary not only to calculate the amount of materials for the garage. 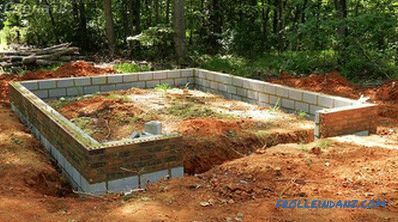 Before you make the foundation for the garage, you must also determine the location of the structure and know where to dig the trench and what size it will be. Therefore, all drawings and plans are made in advance. At the initial stage, a place is chosen for construction. It is advisable to carry out a soil analysis before construction work. This is necessary in order to know the characteristics of the soil. Depending on the type of soil, additional structures will have to be installed (for example, a drainage system). Also, the soil significantly affects the depth of the foundation. 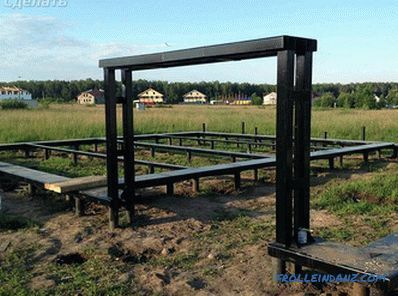 If you do not want to conduct a study of the soil, then on average it is necessary to set the depth of the trench for the foundation at the level of 1 meter, and its width must be at least 40 cm. 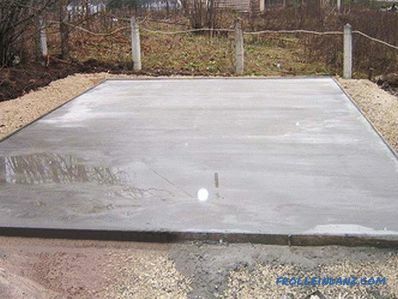 There are many types of foundations for a garage. Theoretically, the builder can install almost any of them, with the exception of those that may prevent entry to the premises. 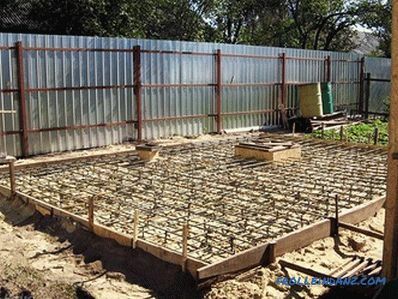 Making the foundation for the garage with your own hands, it is better to choose a kind of it that does not require heavy equipment and a large amount of labor. 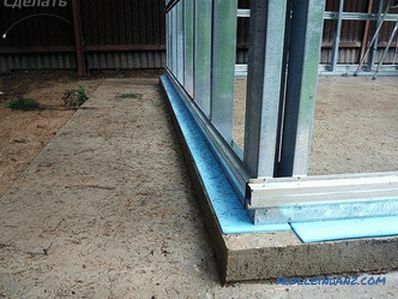 The most common option is a monolithic strip foundation. It is fairly light in execution, except for the abundance of earthworks. 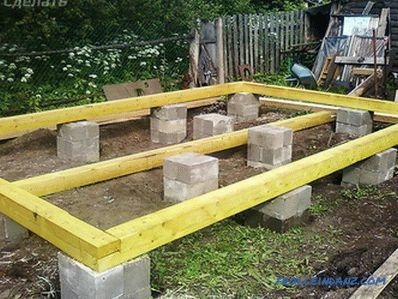 You can also make a concrete foundation, which is a kind of tape. You first need determine the size of the foundation. They depend on the size of the future garage and its severity, as well as on the characteristics of the soil. On average, the depth of the trench under the foundation should be from 70 to 100 cm, and its width is about 40 - 50 cm. Width can be increased. 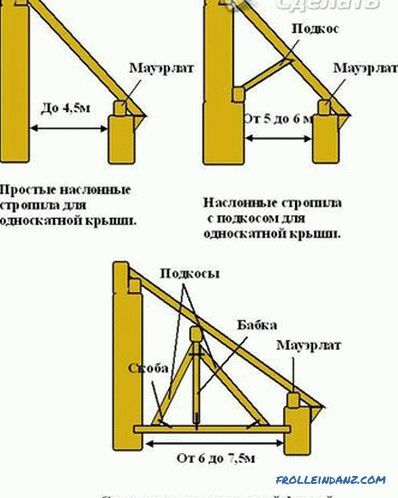 The length is determined by the dimensions of the structure. After the marking has been done, earthworks must be started. The depth of the basement under the garage, as well as other characteristics, should be measured. When the trench is ready, you need to pour sand and gravel on the bottom. The composition is rammed to increase the density. Now it's time to install the formwork. 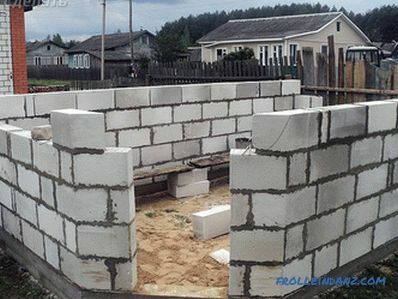 There are two ways to get the formwork for the foundation: you can buy it or make it yourself. The second option is less preferable if the builder does not have skills of similar work. In the process it is very difficult to withstand all sizes, and the formwork must be executed immaculately. Each of its elements must be made extremely precisely in size, so it is better to purchase a ready-made kit or order its manufacture. 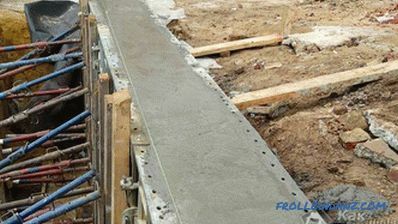 Formwork installation is made as standard. The main thing - in the process of work, how to fix it, so that there are no distortions and deviations. After installing the formwork, it is necessary to start pouring the foundation. 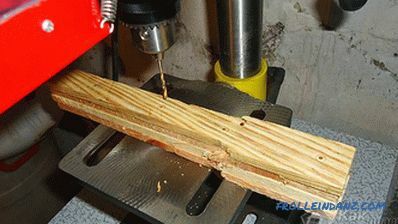 Before pouring, you should decide whether to reinforce the structure. 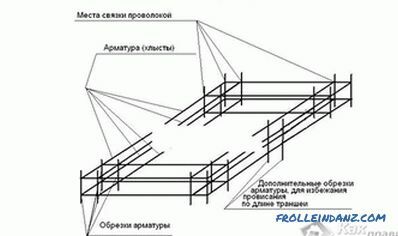 If yes, then it is necessary to install reinforcing bars or even reinforcing mesh. Concrete is not immediately poured, but stages. 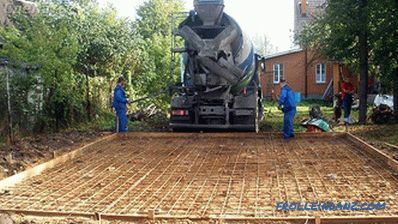 At each stage, the concrete must be poured so that its layer is about 20 to 30 cm. When this layer dries out, you can do the following. The concrete foundation of the garage is one of the most economical designs (especially considering that there are no expenses for the work of the construction team). For its construction will require cement and rubble stone. First, they make the markings of the foundation and dig a trench, as well as when arranging the strip foundation. Then prepare the rubble stone and cement mark 400, as well as sand and gravel. Sand and gravel are poured on the bottom and tamped. A mortar is prepared from sand with cement. Two buckets of sand should be put on each bucket of cement. Water for such a composition will be required around the bucket. The first row of rubble is laid on the bottom. From above the stone is poured over with a cement-sand mixture. Then you need to lay the stone again and pour the solution. So work should be continued until the last layer of cement reaches the edge of the trench. The floating foundation is kind of tape design. It is perfect in the event that the garage will be built on not very reliable ground. Such a foundation will be able to withstand the fluctuations of the soil and the vagaries of the weather, as well as quite high loads. 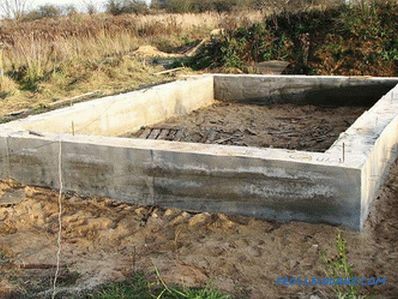 What is a floating foundation? It resembles a reinforced concrete slab, which at the same time is recessed. For the construction will require cement, reinforcement or reinforcing mesh and roofing felt. 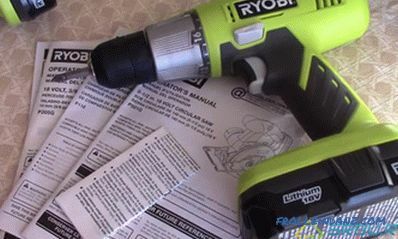 In addition, it is necessary to stock the tool. monolithic reinforced at the edges. The most economical option is the first. 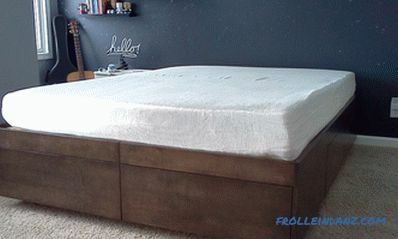 The second option, especially collapsible, is expensive. 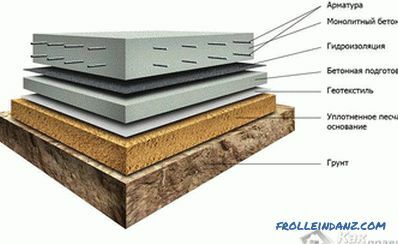 The average in terms of strength and cost is a monolithic slab foundation with stiffeners. 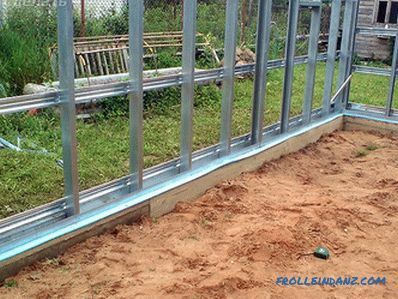 For not too large garages, a simple floating foundation is also suitable. It will be indispensable on heaving soils. First, dig in the foundation pit of the required depth. Usually it is determined by the nature of the soil. At the very bottom of the pit it is necessary to put sand. The sand pillow is rammed. After that, a reinforcing mesh is installed on the sandy layer. It will serve to enhance the design. At this stage you can pour the foundation with concrete. 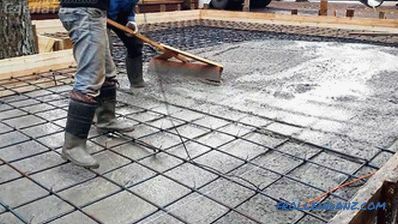 In some cases, the owners first install concrete blocks on the grid, and only then the structure is poured with a mixture for reinforcement. After the cement has dried, you need to make a floor in the garage. To do this, spend the usual tie with sand and cement. 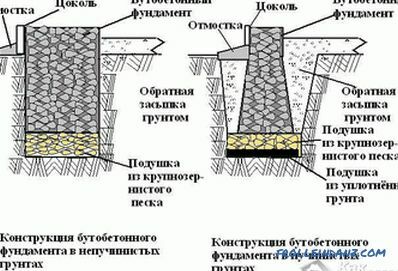 In any case, after the foundation has been made, it is necessary to carry out hydro- and vapor barrier of the floor. You can also install and drainage systems. 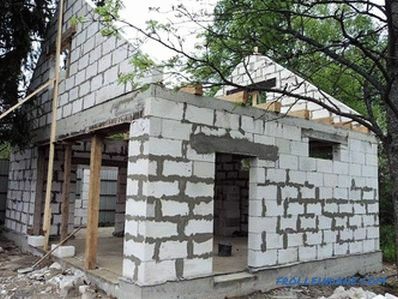 If you decide to build a garage of foam blocks, then building a foundation for it should take into account the technical characteristics of the blocks. Foam block itself is a light material. Therefore, to build too powerful and heavy foundation is not necessary. 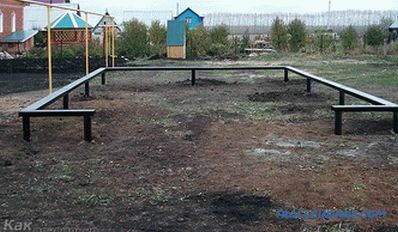 In such circumstances, the type of soil on the construction site plays a big role. For information on how to build a foam block garage, you can get more information in this article "Foam block garage." 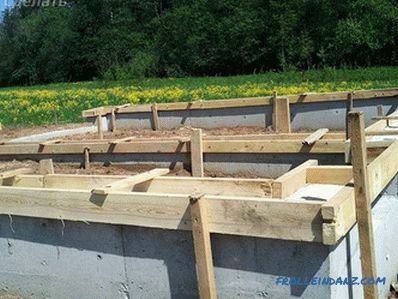 If the level of groundwater is below 2 m, then it is enough to build a strip foundation with a depth of up to 0.5 m. If the soil on the construction site is heaving, then the foundation will need to be made monolithic, as an option from a concrete slab. Why such a contrast, if the foam block itself is a light material? The fact is that this material does not tolerate bending stress. As a result, it cracks and collapses. 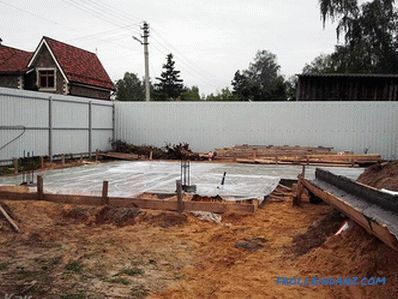 And if the ground begins to move, then to prevent this, a concrete slab is installed on the foundation. As a result, the walls and the foundation will be one. The walls of foam blocks will never go to a break. But there is one limitation. If you plan to build a viewing pit in the garage, the concrete slab is not suitable. In this case, you will need to build a combined foundation of pile-tape or recessed tape.